One of the most talked about flower on my Instagram and Facebook page is Mirabilis jalapa or the old-fashioned four o’clock flower. 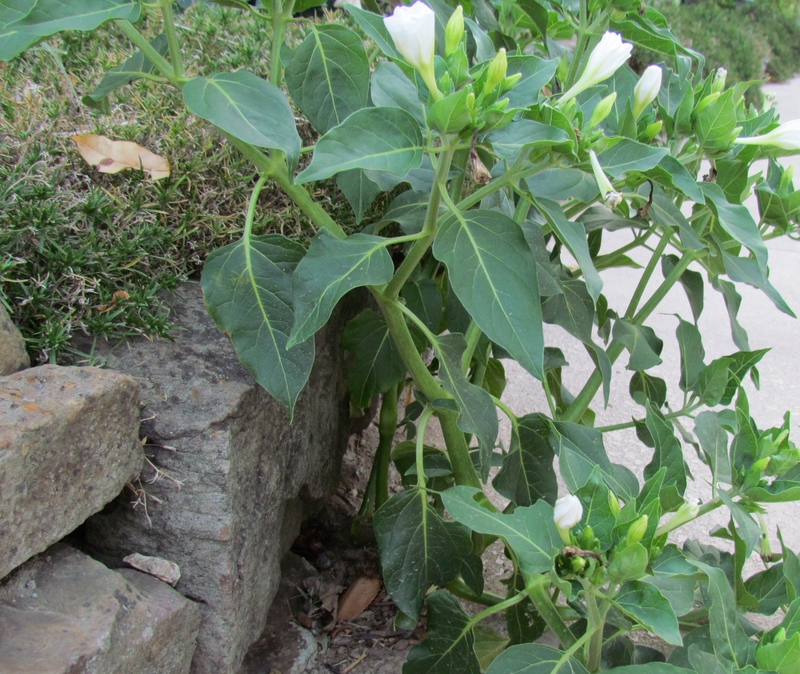 Four o’clocks were one of the first flowers I grew when we bought our first home. I had mentioned to a coworker that I wanted to find a flower that grew quickly from seed and the next day, she brought me a handful of four o’clock seeds. Thirty-five years later, they are still in my gardens. One of the unique traits of this flower is it blooms in the late afternoon or evening, hence the name. I have these flowers in a full sun garden and some in a bed that gets afternoon shade. During the summer heat of the day, the blooms remain closed up tight. But, when it cools off in the evening, the blooms open up and release a very pleasant fragrance enticing all kinds of nighttime pollinators. or both colors on one flower. Saving the seeds are easy because they are big and very easy to see. What I don’t collect, will fall to the ground and sprout next spring. These flowers are pretty tough and will even grow in concrete. Just keep in mind, they might be a different color when they bloom next year. Years ago, I remember reading a gardening book written by Ruth Stout. I don’t recall which book it was, but I remember her making an observation that Japanese beetles loved the foliage of four o’clocks. She somehow made a hypothysis that the foliage was also poisonous to the beetle and would kill it after they consumed it. This theory has been a controversy ever since. For me, in my garden, the beetles go for the roses first. After reading about this , I began planting four o’clocks around my roses, not only to try this theory, but to hide the base of a somewhat gangly rose variety I had. I figure I’m going to grow them anyway, might as well put them to the test. I don’t really have any concrete proof that the foliage kills the beetles, but I have observed that after I see them on my four o’clocks, I don’t see them anymore. Maybe it’s wishful thinking, maybe their lifecycle was complete, or maybe we are on to something. Regardless, they will always be in my garden. What are your thoughts or observations about this? Making honey is no small feat for a bee. Foraging bees must first visit many flowers to collect nectar. Then, it is brought to the hive where a worker bee takes the nectar and places it in one of the openings in the specially prepared comb. Bees then fan the nectar with their wings to remove as much liquid as possible. Somehow they know when the honey is ready and then secrete a substance which covers the honey. This substance will harden and become beeswax. 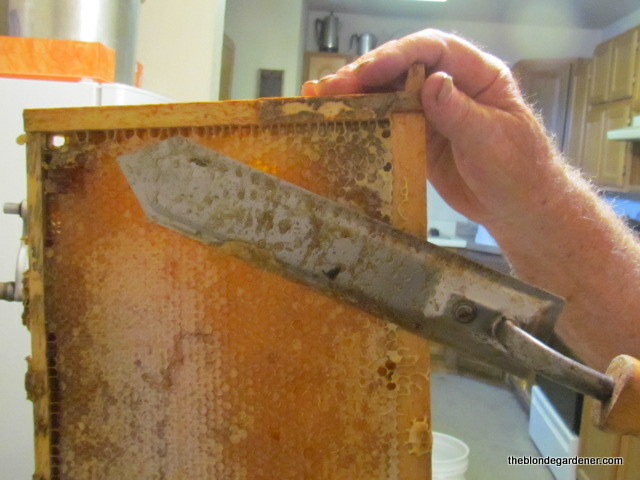 which opens the chambers and allows the honey to flow out. At this point, these cappings can be given back to the bees for food (which I usually do)or heated and strained (rendered) to make the pretty, yellow beeswax used in candles and cosmetics. This year I decided to try my hand at rendering wax. Instead of buying an expensive melter, I opted for a home-made version after I found this large styrofoam container and glass window at my local recycling center. I dug through my cabinet and found some old, plastic bowls. I placed an inch of water in the bottom, rubber banded a paper towel over the top, and placed the cappings on top. I placed the containers in the cooler and covered it with the glass window and left for work. The outdoor temps need to be at least eighty degrees for this to work which is no problem this time of year in Arkansas. When I got home, my pile of cappings had melted down to this. As you can see, the paper towel acts as a filter as the wax melts down (you can use cheesecloth, too but I didn’t have any) and the water in the bowl helps separate the wax from residual honey and other impurities. When the process is complete, rendered beeswax will be floating on top. As you can imagine, these containers were super hot when I removed them from the cooler and everything inside was liquid. I left the bowls on the counter overnight to completely cool off. The next morning, the wax had hardened on top and I was able to loosen the plastic bowl and remove it. There still seemed to be some debris in the wax, so I repeated the entire process again and am much happier with the second rendering. I’m not sure what will become of this beautiful wax, but the process was simple enough to do and only required a few items rescued from the trash. Just goes to show that one man’s trash is another woman’s wax melter! This time of year, the gardens are filling in nicely with a mixture of annuals and perennials. When the summer heat begins to build, I usually devote my garden walks to the early morning or late evening (late evening being my favorite.) During the day though, these plants provide several species of bees, wasps, flies, and butterflies and place to eat. Black Cohosh (Actaea racemosa or also listed as Cimicifuga racemosa) is a native plant in my area. I planted this years ago and it grew but never bloomed. I moved it out of the deep shade to the edge of the woods and I guess it likes the new neighborhood. It is said to have a ‘fetid’ odor which attracts a variety of pollinators. If it does have an odor, I can’t smell it and I have been up close and personal to it while in full bloom. Maybe it’s one of those odors only bugs can smell. is also a native plant. I mainly grow it for the butterflies and bees but have noticed the hummingbirds checking it out. It does spread, though, but not too aggressively, and I noticed quite a bit growing along the smaller highways in Arkansas. Rattlesnake Master (Eryngium yuccifolium) is another native Arkansas plant. This is such a cool plant to grow. The flowers look prickly but are actually very soft. The pointy leaves at the base resemble a yucca plant and look ominous but aren’t too “stickery”. It grows to about 4-5 feet tall so it’s best to plant it with something that can support it. I have it growing with my Grey-Headed Coneflowers (Ratibida pinnata). During the heat of the day, the flowers have a sweet smell similar to honey. Lavender Hyssop or Anise Hyssop (Agastache foeniculum) is another great flower for our pollinators. In the heat of the day, this plant is covered with bees, butterflies and hummingbirds. The leaves smell like licorice which may explain why deer won’t touch it. It does come back every year but sometimes not in the place you planted it. I usually let the flowers go to seed, remove them, and then sprinkle them where I would like them to grow. Yes, they grow that easily. The butterfly garden is in full bloom right now. The back of the bed has bronze fennel which is a host plant for swallowtails. In front of that is bee balm, hyssop, coneflowers and milkweed which is a host plant for the monarchs. Annual petunias and marigolds complete the bed with summertime blooms. And, last but not least, are the purple coneflowers (Echinacea purpurea) For me, a summer garden is not complete without these flowers. Coneflowers are also great plants for pollinators. Newly hatched swallowtails and monarchs are instantly attracted to these nectar-rich plants. Enticing pollinators to your garden is easy if you remember some key ingredients. For butterflies, they need both nectar plants for food and host plants to lay eggs on. But, most important, is a healthy environment to live in. Pollinators are bugs and many people have a problem with them living in the garden. If your plan is to raise butterflies, pesticides of any kind (even some organics) will wipe out your caterpillars. In nature, bugs usually work things out amongst themselves and that’s the approach I choose to take. If you decide to add some pollinator plants to you garden, it’s good to look up or visit a local nursery to see what native plants grow well in your area. Native plants are very hardy and nature friendly which make your gardening experience very rewarding. In a traditional school, different subjects require different teaching methods. I remember learning math with a big chalkboard and pencils with good erasers. English and reading were done in quiet classrooms or libraries and science was hands-on in a lab permanently encapsulated in its own unique smell. Now, imagine yourself doing classwork in a 500-acre forest surrounded by flowers, trees, and birds. Feeling the breeze on your face and the sun on your skin. Smelling the damp earth of the forest floor. Catching a glimpse of something scurrying about out of the corner of your eye. Who wouldn’t want to learn like that? Ozark Natural Science Center (ONSC) in Huntsville offers a unique way of bringing science and nature together in an environment conducive to learning. Their mission is to develop an understanding and appreciation of our natural state by providing educational programs that promote stewardship and conservation of the Ozark ecosystems. I arrived as a group of fifth-graders were preparing for a hike on one of the many trails. Students are provided backpacks, water, and field journals and are encouraged to study the diversity of their surroundings. Guided by a resident teacher-naturalist, we trekked through the woods stopping along the way to talk about trees, rocks, vegetation, and wildflowers. The scenic vista at Wishing Rock overlook provided a nice spot to rest, record notes, or relax and admire the view. or outdoor facilities for informal studies or gatherings. Becky Olthof, Program Manager for ONSC, is also excited about the Adult Field School Programs. Best described as “nature classes for grown-ups,” Olthof explains these classes range from one to three-day workshops. Upcoming classes include nature, history, art, and photography taught by skilled instructors and experts in their respective fields. ONSC is not just for education, though. The three lodges on the property can be rented for meetings, conferences, weddings, and retreats. Each event can be custom designed for your group and can include meals, hikes, and extended stays. For more information about the Ozark Natural Science Center and the programs they offer, visit their website at onsc.us or call 479-202-8340. Spring was a little early this year and it seems like every time I walked through the garden I would find something else blooming. My sea of creeping phlox and creeping jenny is probably my favorite early spring combination. 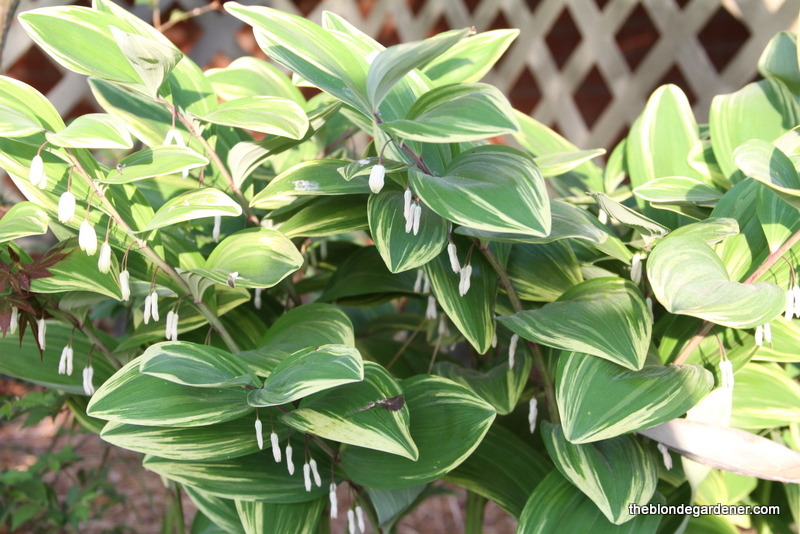 Soloman’s Seal (Polygonatum) is an early bloomer for the shade garden. A perennial in zones 3-9, it can grow up to two feet tall. Tiny, delicate white flowers suspend from the stem and sometimes berries will form but I’ve not seen it yet with this variety. The dark foliage of Heuchera or Coral Bells is a nice contrast against the phlox. 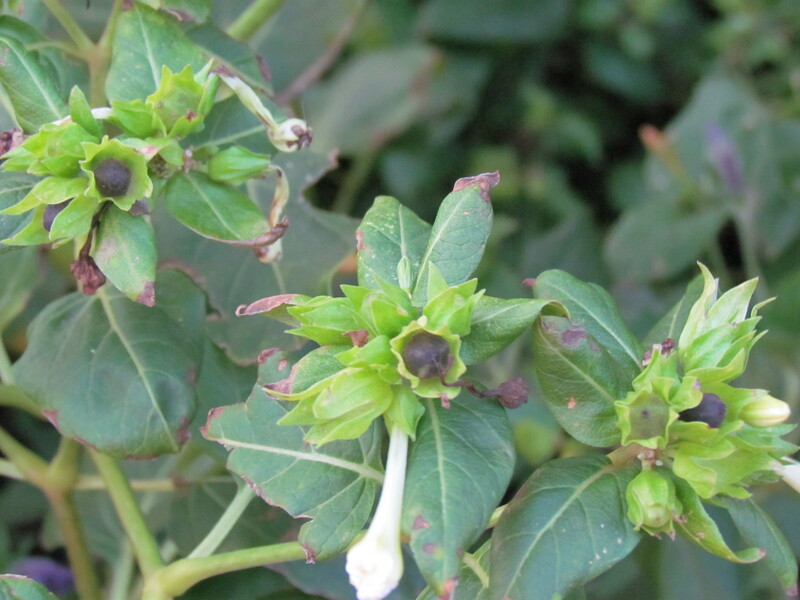 In late spring/ early summer, it will shoot up white-ish flowers on long stalks. Heuchera likes part shade and is a perennial in zones 4-9. Epimedium or Bishop’s hat is a native groundcover in my shade garden. The tiny, yellow flowers will bloom for a short period of time and spread up to three feet. I’ve had this growing next to my hydrangeas for several years and it’s only about two feet wide. About the time it dies back, the hydrangeas are starting their spectacular show. Arkansas Blue Star (Amsonia hubrichtii) is one of my all-time favorite shrubs. It is just now starting to bloom. I’ve talked about it here, here, here, and here. It’s pretty in the spring, summer and fall. I kinda love it. This is the second year for my Buckeye tree (Aesculus Pavia) that I started from a buckeye seed. It’s a small tree so it needs some room. I will probably have to relocate it since it’s doing so well. The most popular Ozark folklore says carrying a buckeye in your pocket is good luck. Another popular saying is, “You’ll never find a dead man with a buckeye in his pocket”. Others claim it helps keep rheumatism, hemorrhoids, migraines and other ailments away. That’s one powerful seed. By now you know I like to add other objects throughout the garden. My spider and garden fairy came out of hibernation to watch over the phlox. And even Daisy, in her grumpiest of moods, likes to keep tabs on all of us. What are you seeing in your garden? This time of year starts a frenzy of garden to-do lists. Seed packets are organized, new seed varieties are studied, and plans are being made for the gardens. Not much can be planted outside now, but the greenhouse space is already filling up. For my garden, ornamental grasses, climbing roses, and hydrangeas can be cut back in preparation for spring. Timing for this is usually late winter but it seems late winter came in January this year. My daffodils were in full bloom by the third week of February and have survived a couple of hard freezes. You have to be a tough plant to live in my garden and these have garnered much respect this year. Ornamental grasses can be cut back to make room for spring growth. In this case, I found blooming daffodils. Cutting back hydrangeas depend on the type you have. Some hydrangeas bloom on new wood and some on old wood. 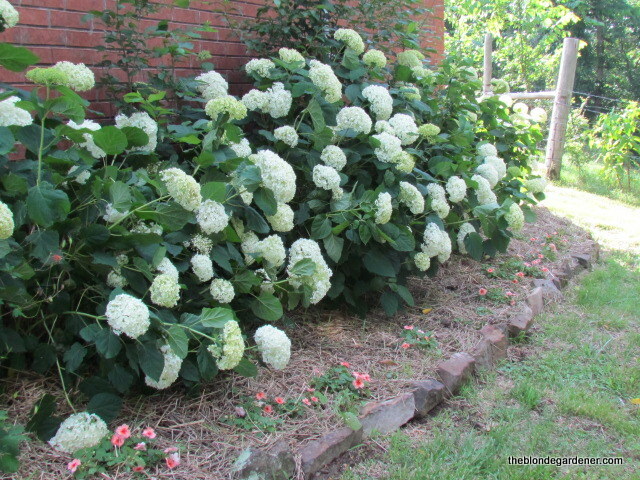 My ‘Annabelle’ hydrangea blooms on new wood, so I can cut them back and get a fresh flush of growth in spring and abundant flowers in the summer. If your hydrangea blooms on old wood, cutting the plant down will not give you any blooms for the year and that’s just tragic. In my opinion, summertime shade gardens are not complete without the spectacular blooms of a hydrangea. If you are unsure what type you have, just leave it alone for a season and it will show you. If you don’t have time to cut back your new wood bloomers, don’t worry, they will still bloom. I just don’t like looking at naked branches mixed in with blooms. Not that you can really see them but, by March, my pruning disorder has kicked in and makes me a crazy, twig-trimming women. From now until fall, pruners will be part of my wardrobe, snug in my back pocket, ready to be whipped out at a moments notice. Sometimes, as I’m trimming up plants, I find surprises. These are praying mantis egg sacs. They are so tightly woven, they are almost impossible to penetrate. This particular shrub had five on it. Considering each case holds approximately 300 babies means I will have an army of bug eaters working for me this summer. Unfortunately, praying mantis cannot distinguish good bugs from bad bugs. I have seen them pounce on a grasshopper, munch on a spider and, sadly, eat a butterfly. I read they will also eat bees, mice and small frogs. I can only hope they develop a taste for moles because, looking at all the tunnels I have in my yard, I must have hundreds. Dreary days in the winter don’t work for me. I can tolerate the cold if the sun is shining, but when it’s not, it can be so depressing. Usually when this happens, I head to the kitchen and cook. It’s still January though and everyone is still trying to get their holiday indulgences corrected so, therefore, I have been banned from making my signature dessert. I started making cookies when I was a little girl and like to feel I have become an accomplished cookie maker (if there is such a thing.) So, when our Master Gardener group put out a call needing cookies for their upcoming training, I jumped on it. After the meeting, I got a text saying several people wanted the recipe, so I thought the best way to share is to put it here. I’m going to add a couple of more recipes as well. Hope you don’t mind. Making cookies is not hard and my grandkids love to help me when they are here. But, there is a science to cooking and that’s why recipes have specific measurements. I know some people do a pinch of this or that, but that never worked well for me. I like to follow directions. We like our cookies soft and chewy so I always use a good quality, unsalted butter. I get mine from the Amish store in my town. It comes in a round, wheel shape, not sticks, so it has to be softened and then measured. There are many reasons why you use unsalted vs. salted that I won’t go in to, but feel free to research the topic if you like. I also make my own vanilla, which is super easy, and has a more vanilla-y taste to it. You can find out how I made my own here and here. If you don’t want to do that, then be sure and buy pure vanilla extract and not imitation. It’s a bit more pricey, but worth it. Sorry, I don’t have many pictures, I never thought about taking them while I was cooking. I feel this first recipe needs a disclaimer. IT IS PURE SUGAR and I am not responsible for any cavities you may incur during the eating of this cookie. Please brush and floss and see your dentist and hygienist every six months. Consider yourself warned and eat at your own risk. 1. Combine pecans, coconut, and vanilla and set aside. large saucepan. Bring to a rolling boil and boil for 3 minutes. 3. Remove from heat and add pecans, coconut, and vanilla. 4. Stir for about 4 minutes. 5. Take a spoonful of batter and place on wax paper. Let sit until hardened. The next recipe calls for zucchini and is a different way to use the extra we always seem to have during garden season. It also calls for granola cereal, but I have always made these with homemade granola so I will include that recipe as well. (or juice), and vanilla. Combine flour, granola, baking soda and salt. Add to creamed mixture alternately with zucchini. The batter will be very stiff. Stir in chips. parchment paper. Bake at 350 for 8-10 min. or until lightly browned. Remove to wire racks to cool. Makes approx. 6 dozen. Bring to a boil and boil for 1 min. Pour over the oat mixture and stir until well blended. Spread on lightly greased cookie sheet. Bake at 350 for 20 min. stirring every 5 min. For a different twist on granola see my Pumpkin Honey Granola recipe here. Whenever I comment on a great food I have eaten or complement a cool project someone has done, it’s usually followed by the phrase, “I got it off Pinterest”. Pinterest is a great source for ideas and when my internal alarm clock goes off extra early, I find myself perusing the endless pictures of recipes and decorating ideas. Through these sessions, I have created 59 boards of things I like and would like to do. Many of our lake house ideas have come from Pinterest. The corrugated metal shower and ceiling Allen and his brother constructed is one of my favorites. Along with the light fixture my dad made from a funnel. You can find ideas and tutorials on just about anything crafty, so when I found some ideas for garden décor, I was inspired to try a few. Most of my projects turn out fine. I like to incorporate simple accents throughout the garden to compliment the flowers which I see as the main focal point. One project I used an old bed frame to border the back of my ornamental grasses. It’s been painted a variety of colors over the years and was a super easy project. This summer, on Pinterest, I saw where someone had made a flower from a kitchen whisk. I was picturing in my mind what a whimsical accent this would be in a container planting. So, I jumped in my car and headed straight for the dollar store. I believe the price was $.97 so I bought one. That gave me only one chance to make this work. What they don’t tell you is how soft and bendable the wire is on these things. Yet, once it’s bent, it is extremely hard to manipulate into another shape. Overall, it wasn’t terrible. Realistically though, it looked like a toddler had created it. I still stuck it in a basket of dried hydrangea blooms and called it good. Another project came to me as I was cleaning out the barn and found quite a bit of tie wire. Tie wire is soft, easily cut, and used as a fastener. I always keep some handy in case my chicken wire fences need to be reinforced. I remember seeing another Pinterest project that involved tie wire and a blow up beach ball. You simply blow up a beach ball and wrap tie wire around the ball. When you get your desired look, let the air out of the ball and voila, instant outdoor decor. In my mind, I envisioned these balls decorated with solar lights hanging from the trees or sitting in my flower beds emitting a casual, relaxed glow. It would be amazingly cute and talked about for decades. Since it was summer, I just happen to have a beach ball handy and I quickly blew it up and began to work. I could not get the beach ball nice and full to save my life. I tried and tried to blow it up more but every time I tried to push the little plug back into the ball, more air would come out. One step forward, two steps back kind of thing. Maybe it was the tie wire. The directions called for a specific gauge of wire but my original packaging was long gone. The wire I had was very bendable and I could tell right away this project was going south on a fast moving bus. Optimistically, I continued. Maybe it was one of those projects that would miraculously be perfect when I removed the beach ball. As I carefully wrapped the wire around the not so full beach ball, I could tell this was not going to be the case. My frustration increased as each and every wire wrap around the ball took on a hideous, distorted shape. Realization set in and I knew in my heart this project was not going to turn out as I had expected. So, with heavy heart, I let the air out of the beach ball to face the cold, hard truth. It was then, that my frustration turned to laughter. I laughed and laughed. I walked away and when I returned, I laughed even more. Never had a project turned out so bad and made me laugh so hard. As bad as it was, I couldn’t make myself throw it out. I decided to keep it in the barn, on the bench, so I can see it when I first walk in. And every time, even months later, it makes me laugh. I’m also sure it will be talked about for decades-just not in the original way I had imagined. Although some people (ok most) will see this as a Pinterest failure, I see it as a reminder to not take myself so seriously. Don’t get me wrong, my pitiful garden globe will never see the outside of the barn. It will, however, make me smile every time I see it. And, for me, that is not a failure. I am a simple person, I am not a political person. I never felt I was knowledgeable enough to debate any issues and I, for one, am glad the election is over. No one knows what is in store for our country but, for better or worse, the American people voted in a new president. Tuesday, I cast my vote and now I am ready to move forward. One of our favorite sayings to our kids/grandkids is: You get what you get and you don’t throw a fit. Simple concept to understand and for some reason seems appropriate for this election. 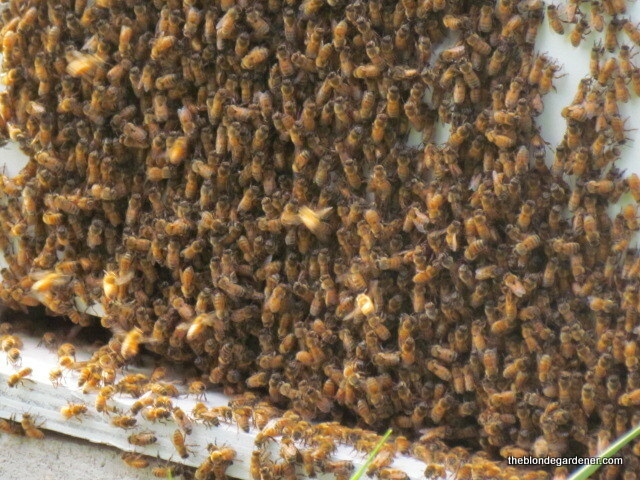 As I was looking in on my bees yesterday, I couldn’t help think how similar the election process is to the dynamics of a beehive. 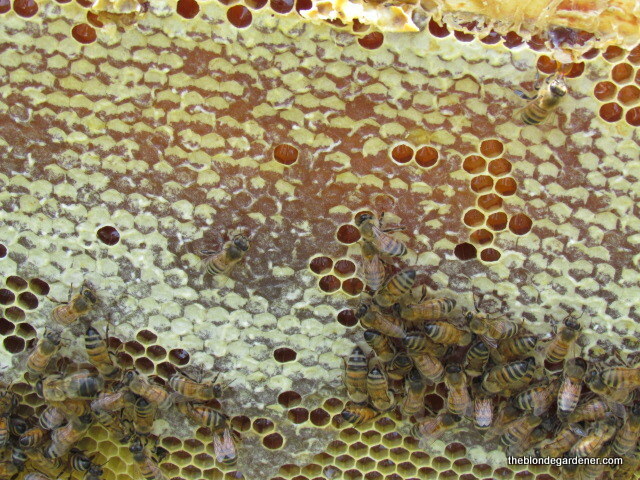 In the beehive, the queen bee is similar to a president. She is the most important bee in a hive of many workers. 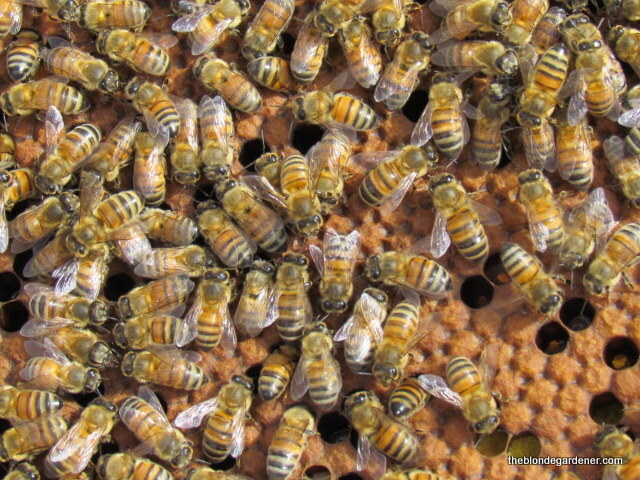 When the queen begins to decline, the workers of the hive instinctively begin the process of replacing her. 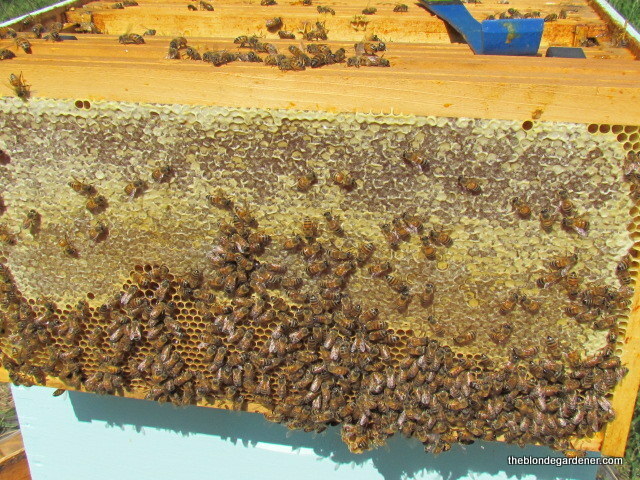 They work together to select the best eggs and feed and nurse those eggs until they are ready to emerge as queen. The first queen to emerge kills her competition (this is where we differ, thankfully). With the new queen victorious, the old queen and new queen go to battle. The strongest queen wins and the hive accepts this outcome and continues to work together to make a stronger hive. They realize that even though they may have a new leader, the common goal has not changed in the hive. Agree or disagree with the election results, my only advice is to think like a bee. Accept the outcome, work together, and be a productive citizen for this great country. For my simple mind, this concept just makes good sense. God Bless America and to all of our military, past and present, Happy Veterans Day. Our country is great because of you. I’ve been on a granola kick lately. 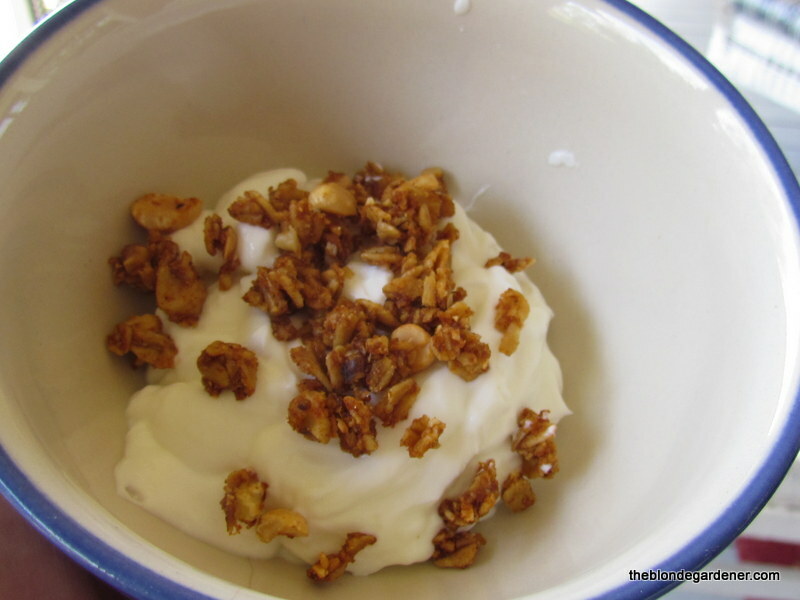 I love the crunchy texture in my yogurt and oatmeal (which I eat almost every day), so I go through a lot of granola. It all started when I bought a bag at the Amish store in town. It was flavorful and fresh, but also pricey, so I knew I needed to learn to make this myself. This is also the season for everything pumpkin. The poor pumpkin is basically ignored until October. Then, for the next three months, it’s game on. So far this month, I’ve made pumpkin bread, pumpkin muffins and now…. I can definitely say life is better with pumpkin granola in it. 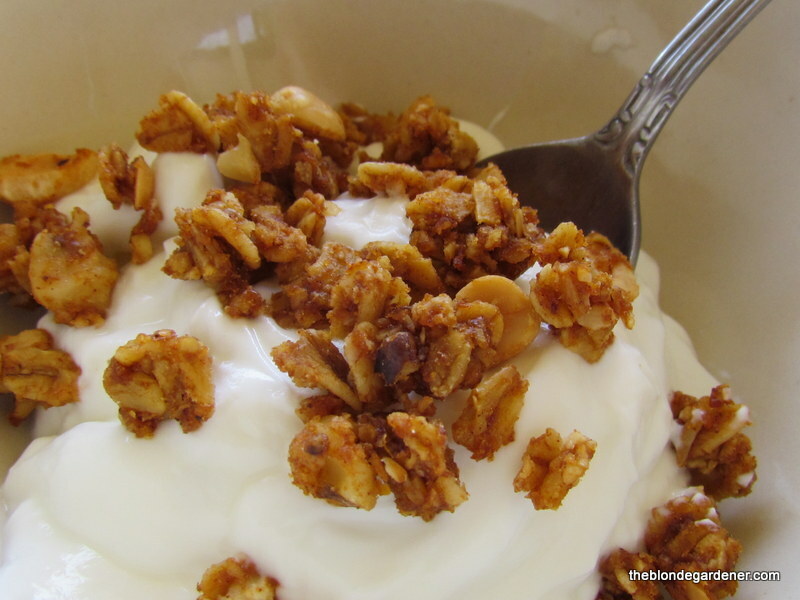 Granola is a very easy and forgiving snack to make. It adapts well to substitutions which is good since I adapt quite a bit when I cook. Here is the original recipe and here is my version. all ingredients are wet. Spread mixture on a baking sheet. mixture to evenly bake. Remove from oven and allow to cool. *Side Note: This summer, when I attended the Farm2Home Event at Moss Mountain Farm, I met the maker of a special sunflower oil. Made on Wayne Plantation in Scott, AR, this virgin sunflower oil is cold pressed to retain flavor, aroma, and nutrients. As an added bonus, it’s made with non-GMO sunflowers, provides twice the amount of Vitamin E than olive oil, and is low in saturated fats. Sounds like healthy to me. I love it when that happens. When I made the last batch of granola, I used this oil in place of vegetable oil. What a difference! The nutty flavor of the oil was the perfect compliment to the already nuttiness of the granola. Goodness Gracious this is Good Granola. I guess what I’m saying is, don’t be afraid to play around with this recipe. The slightest substitution can make a surprising difference.